It was under 14 minutes in the championship match of the Memorial Super Cup between Matrix Elite U17G and Scottsdale (Ariz.) Blackhawks. Matrix was down 3-2 when Coach Hector Romo moved his daughter Briana from center back to forward. The move paid off as Brianna drilled home the tying goal. With minutes left in the match, winger Jeny Tapia maneuvered her way down the left flank and curled in a shot that dropped just inside the far post, sealing a dramatic 4-3 victory for our U17G team in the Memorial Super Cup on May 24. It was an emotional win for Coach Romo, in his last match with the team that he has guided as coach or assistant coach since the girls were U10. South Bay Matrix is so often about family, and that was never more evident than in this last match for several players who are soon graduating high school and moving off to college or military careers. It could not have been scripted better with Brianna scoring the tying goal and Jeny the game winner in their last match together with Coach Romo, who will continue coaching his U12G team next season. Matrix South Bay Director of Coaching Memo Medina will take the reigns of this talented group of ladies as the team reloads for next year as U19G Matrix Elite. For now, however, parents and players relished the victory in a tough, physical match that saw yellow cards earned by both squads. Parents and players thanked coaches Hector Romo and Ronaldo Tapia (their first Matrix coach and Jeny’s father) for their dedication and support. Credit was given to Blackhawks soccer as a good, athletic side and quality competition. Matrix South Bay congratulates each of our U17G graduating seniors Jeny Tapia, Nicole Rea, Bri Romo, Jazmine Garcia, and Alex Valenzuela. Going out as champions! South Bay Matrix teams will be sporting a new uniform style for the 2015 season. Our teams’ adidas jerseys will display the Fox Sports 1 logo prominently out front, as well as our region specific shield/logo. All new Matrix South Bay and Matrix Elite (Academy) level teams will wear the new style. Returning teams with existing jerseys will be able to retain the prior style for one more season. In addition, Matrix or Matrix Elite will adorn the front of the jerseys. The additions to the front of the jerseys will help build brand recognition for Matrix, South Bay AYSO, and Fox Sports 1. The traditional AYSO logo will adorn the left sleeve. Matrix is the competitive soccer arm of South Bay AYSO. Our teams play in either the Presidio League or the San Diego Development Academy. Teams are issued home and away jerseys. The new design looks good, and will enhance pride in our traditional maroon South Bay AYSO league color, and look sharp in the white alternate jersey as well. Special thanks go out to Uniform Coordinator Santiago Villanueva for working with AYSO National to secure approval for our new style. Parents, Community Members and Players: Come out and support our league as South Bay Matrix holds a fundraiser on Monday, April 27 at Boll Weevil on Saturn Blvd., just off Palm Avenue. The fundraiser will take place from 5pm-9pm and 20% of the proceeds will go towards coach gear and equipment. The more family and friends who come out, the more funds get pumped right back into our program in the form of coaching apparel and equipment. Equipment such as team sets of practice balls or training goals will help ensure our players get the maximum experience from training sessions. Help us make this event a success! Kick off the tournament season with the San Diego Super Cup on Memorial Day Weekend. This tournament hosts teams from Silver and Bronze levels. This Cal-South sanctioned tournament is held on Saturday and Sunday May 23-24, 2015. Click here for more info. Torrance, Calif. (March 11, 2015) —The American Youth Soccer Organization (AYSO) and FOX Sports today announced a jersey sponsorship as part of the five-year partnership between the two organizations. Starting this spring, it’s expected that 500,000 AYSO players will wear the new official AYSO-FOX Sports 1 jersey. FOX Sports 1 is prominently displayed on the right chest of all AYSO jerseys. The AYSO logo has been displayed on the left chest of all AYSO jerseys for 50 years. The announcement and jersey were unveiled on-air during FOX Sports 1’s coverage of the U.S. Women’s National Team Algarve Cup Final by FOX Sports analyst and AYSO alumni Alexi Lalas and AYSO National Executive Director Ian McMahon. To view full announcement or for additional information, click here. On to the State Semi-Finals! 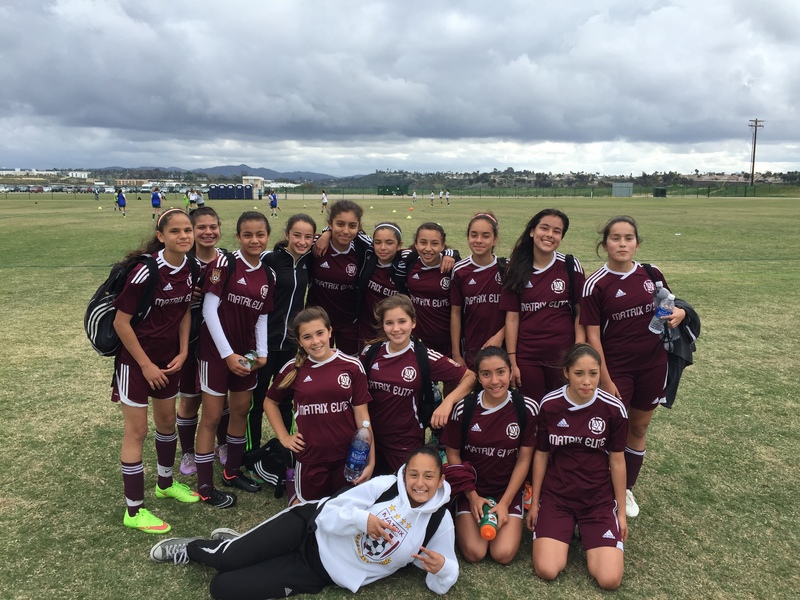 AYSO South Bay’s U13G Matrix Elite team defeated rival Nado 2-1 in overtime on Sunday, February 22, 2015 to advance to the Final Four of the State Cup Presidents Division. The semis take place on Saturday, February 21 in San Bernardino. South Bay trailed Nado 1-0 at the half. The equalizer came in the second half, which seemed to swing the momentum to the Matrix Elite squad. South Bay scored in the first overtime period, and held on to secure the victory. The South Bay girls had knocked out another local rival, Rebels Blue of eastern Chula Vista, 1-0 on Saturday, February 21 to advance to the quarter-finals. Aviles said his team is not satisfied just advancing. “This isn’t over yet. We’re happy to advance to the semis, but we believe in each other and believe the State Cup can be ours for the taking no matter how challenging these last steps are going to be,” he said. Photo Caption: South Bay U13G Matrix Elite squad proudly represents their community–and AYSO—in the Cal South State Cup Presidents Division. Matrix South Bay Futbol Club is dedicated to providing a quality player development program using the philosophies and programs of the American Youth Soccer Organization. Our goals are to provide youth players an environment that nurtures and develops their abilities in soccer within a competitive arena that matches their skill with basic values and character development off the pitch.